You may remember I mentioned using Sarakan mouthwash on a regular basis. 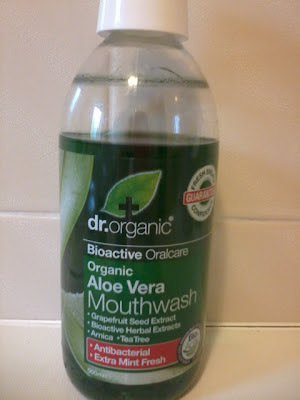 The last time Holland & Barrett had a ‘buy one get one half price’ offer I picked up Dr Organic Aloe Vera Mouthwash (500ml £5.69). For those not familiar with the brand, Dr Organic is suitable for vegetarians and vegans, against animal testing and free from synthetic ingredients. Obviously I am not a dentist so you have to trust that this mouthwash is doing as it claims - "A natural and protective formulation to help maintain strong, clean teeth, healthy gums and minty-fresh breath." I have to say I am not a fan of the flavour and prefer Sarakan. I struggle to describe the taste but it is not the minty flavour I desire. I do like that the bottle comes with a dosing cap. I always think it is unhygienic using the cap when saliva can pass back into the bottle. I will not purchase this again and will continue to use Sarakan. Do you use a natural free from mouthwash? a mixture of water and tea tree oil works for me :) I hate that so many on the market have gross ingredients, but artificial dyes too. thanks for the tip, main stream mouthwashes make me shudder, they remind me of the dentist from the smell and I have a phobia. That's why I have been experimenting with more natural brands.